With my recent trip to Keukenhof in the Netherlands, I was able to have another glance at just how beautiful our earth can be. Keukenhof “Garden of Europe” is home to one of the biggest tulip fields in the world, giving Holland its famous landmark. We were here in time for spring and also one of the best days with sunny skies and no rain. (Best time to view these famous tulips and flowers was in mid-April so we were actually there at the perfect time!) There were many tulips blooming everywhere I looked and it was nearly impossible to take a bad picture. Here’s just one of the photos I took using my phone camera. I barely had to focus on it or look for a more “perfect” tulip as every single one was so shapely and beautiful. 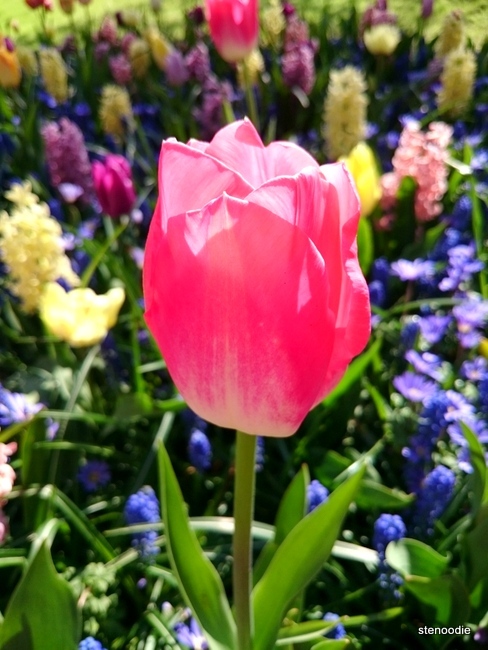 This entry was posted in Weekly Photo Challenge and tagged beautiful tulip on our beautiful earth, blooming tulip in Kenkeuhof, earth, Keukenhof, Keukenhof Garden, Lisse, postaday, South Holland, weekly photo challenge. Bookmark the permalink. It must be amazing to see field after field of tulips. I’d love to. I was there in the 70’s, but not when the tulips were blooming. I missed the tulip season the last time I went to Netherlands so thank you for this beautiful description. It sounds gorgeous.